*** Please note the Change of Time to 9:00 pm. 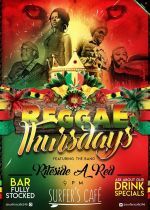 On Reggae Thursdays, you'll be entertained by the band Riteside A Red. Free WiFi provided for customers, so bring your laptop and cyber surf by the sea.